Elasticated drawcord in hood and hem. Taped seams for protection against rain. Tab and Velcro adjustment at sleeve end. Concealed mobile phone pocket under storm flap. Hood can be concealed in collar. 98% Polyester, 2% Anti-Static Carbon fibre, with 100% Breathable PU Coating 250g. 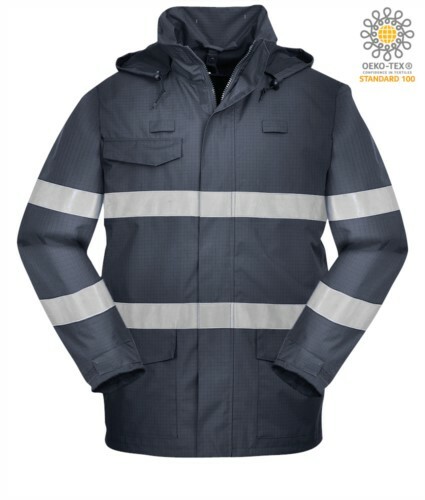 Dear friend, I suggest you this article: TRIPLE PROTECTION RAIN JACKET ; You can find it on the web at: https://www.castbolzonella.it/scheda.asp?content=.